The Scottish government’s request for the public’s views on a proposed network of marine protected areas (MPAs) closes today (November 13th) with over 10,000 people asking for more ambitious protection of sealife in Scotland. Over half of these public response came from WDC supporters alone! The Scottish government opened the public consultation asking people what they think of its current plans to create these protected areas in the seas around the Scottish coastline. Sadly their plans still do not guarantee any protection for whales and dolphins. So WDC has been urgently requesting that people tell the Scottish government what they think about that, encouraging the public to write a letter to ministers supporting the current plans for protected areas in the seas off Scotland, but asking the government for whales and dolphins to be protected when it makes its final decision. 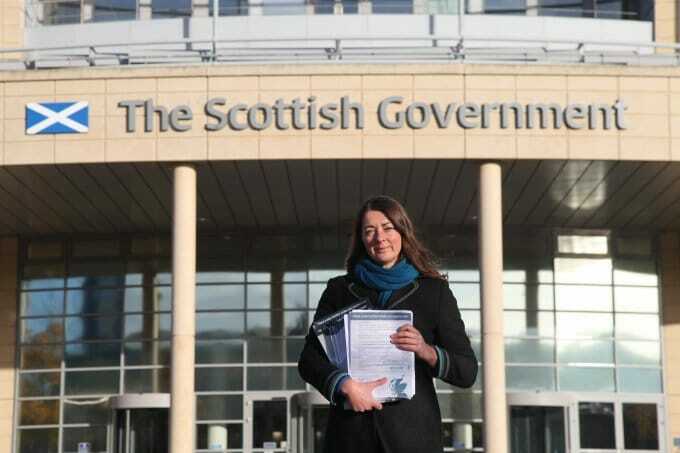 WDC couldn’t have been prouder to hand over the heart felt consultation responses, hand written by our supporters, to add to the thousands of emails that had already been received, as part of the Scottish MPA process. This demonstrates the overwhelming level of support for whale and dolphin protected areas that exists both with Scottish residents and visitors alike.